The word is nearly ubiquitous: at the grocery store we shop for "sustainable foods" that were produced from "sustainable agriculture"; groups ranging from small advocacy organizations to city and state governments to the United Nations tout "sustainable development" as a strategy for local and global stability; and woe betide the city-dweller who doesn't aim for a "sustainable lifestyle." Seeming to have come out of nowhere to dominate the discussion-from permaculture to renewable energy to the local food movement-the ideas that underlie and define sustainability can be traced back several centuries. In this illuminating and fascinating primer, Jeremy L. Caradonna does just that, approaching sustainability from a historical perspective and revealing the conditions that gave it shape. Locating the underpinnings of the movement as far back as the 1660s, Caradonna considers the origins of sustainability across many fields throughout Europe and North America. Taking us from the emergence of thoughts guiding sustainable yield forestry in the late 17th and 18th centuries, through the challenges of the Industrial Revolution, the birth of the environmental movement, and the emergence of a concrete effort to promote a balanced approach to development in the latter half of the 20th century, he shows that while sustainability draws upon ideas of social justice, ecological economics, and environmental conservation, it is more than the sum of its parts and blends these ideas together into a dynamic philosophy. 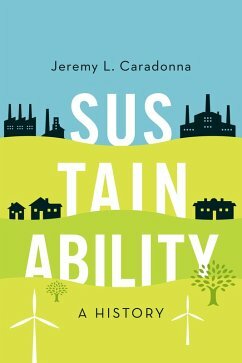 Caradonna's book broadens our understanding of what "sustainability" means, revealing how it progressed from a relatively marginal concept to an ideal that shapes everything from individual lifestyles, government and corporate strategies, and even national and international policy. For anyone seeking understand the history of those striving to make the world a better place to live, here's a place to start. Jeremy L. Caradonna is Associate Professor of History at the University of Alberta. He is the author of The Enlightenment in Practice.